Turn back the clock some 800 years and apples were abundant all across Scotland. Orchards were common on large country estates and in city center monasteries, some numbering upwards of 10,000 trees. Much of today’s Merchant City in Glasgow is thought to have been built on the site an old orchard. Scottish apples were a bumper crop right into the late 19th century and were once shipped all over the world. The invention of refrigeration would change all of that. Cheaper varieties, like Granny Smiths and Golden Delicious, were imported and slowly but surely edged locally grown Scottish varieties off the market shelves. Scotland’s apple orchards began to disappear. It may surprise you to learn then that artisan ciders are the new "big thing" in the Scottish drinks sector, fueled by Scottish apples with wonderful varieties like the Lass O'Gowrie, the Bloody Ploughman, the James Grieve, The Tower of Glamis and others that are making a comeback. The 2014 National Orchard Inventory for Scotland, the first to be conducted in more than a century, found orchards in 31 of 32 local authority areas. Most are small family owned orchards of 30 to 100 trees but the resurgence is undeniable. Scottish apples of many varieties all but disappeared in the late 19th century but today are enjoying a comeback that is fueling the newest sector of the Scottish drinks industry, cider. 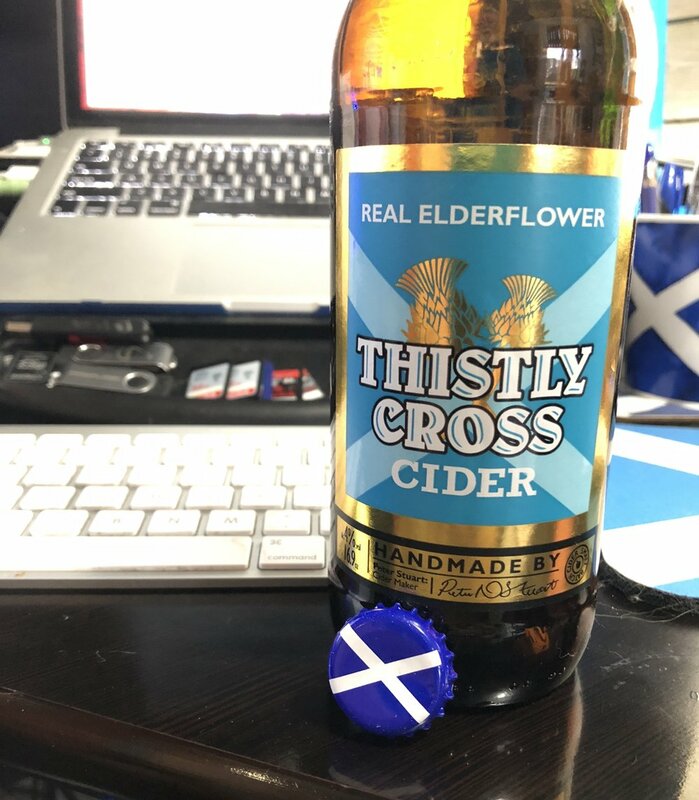 Helping to lead this resurgence is Scotland's original artisan cider, Thistly Cross. This farmhouse cider is produced in Dunbar, East Lothian, and was co-founded by farmer, Ian Rennie and artist turned cider maker Peter Stuart. The company started trading at local farmer's markets but today is marketed internationally with the USA as it's largest overseas customer. Thistly produces a range of ciders from it's core group featuring Original, Traditional, Whisky Cask, Strawberry, Elderflower, and Ginger, plus occasional special limited editions like a recent collaboration with the Bavarian whisky distillery Slyrs. Most recently they've also introduced a new "cloudy" cider. These varieties range in alcohol by volume from 4.4% to 6.9%. Each is slow fermented and long matured for six months. From planting some of its own orchards to eventual plans for its own bottling plant, Thistly is uniquely invested in every aspect of its product. Recognizing Scotland's excellent reputation as a brand in the drinks industry, head cider maker Peter Stuart says being a product of Scotland has been of great value to the company that is nearing its 10th anniversary. They celebrate Scotland with their labeling - each features a St. Andrew's cross in the background while the bottle caps are the distinctive St. Andrew's blue and white which many will recognize as the national flag of Scotland, the Saltire. Almost humorously Stuart says not everyone recognizes the Saltire or St. Andrew's cross, but everyone understands pirate maps, so the company likes to say "X marks the Thistly." Nearing its 10th anniversary, Thistly Cross is a multi award winning cider yet it remains very close to its original farmer's market roots through its unique "Bucket for a Bottle" apple exchange program. Growers with unwanted fruit or even those with just a tree or two in the garden can exchange 7kg of good clean fruit for a 330ml bottle of cider.. Even with its own orchards this donation program remains a large part of Thistly's production. Finding Thistly Cross in the USA may take some effort but it is widely available. Below is a partial list of states with the distributing company that can be contacted for help. Otherwise, if there is a World Market or Whole Foods nearby Thistly is an approved product for them but not every location will stock it. Just look for the distinctive blue and white bottle cap! Fore more about Thistly Cross and cider see the links below, and don't miss other podcast episodes on Scottish Food and Drink.